Our mission has won the Gabriel! For the thirteenth time, and the tenth in a row, the Catholic Academy of Communications Arts Professionals is giving KNOM its 2005 Gabriel Radio Station of the Year Award! KNOM is the only religious station, and the only small station, to receive this huge honor. We hope that you are as thrilled as we are! Can you join us at the awards ceremony? As every day, we thank you for your faith in us, for your gifts to our mission and for your prayers. PRESS TIME (left): Alaska's U.S. senators have visited KNOM many times. However, this summer saw the first time that a U.S. senator had ever held a press conference at the station. 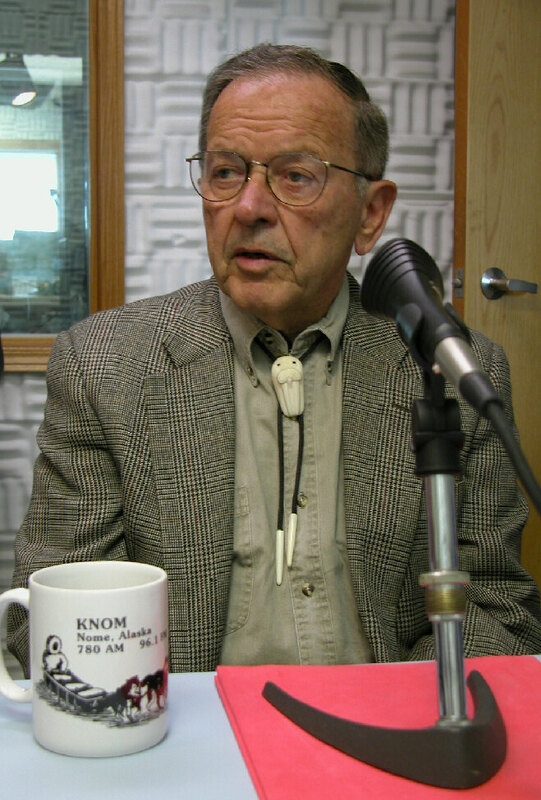 In August, Senator Ted Stevens did just that in Studio C, for KNOM, the Nome Nugget newspaper and other reporters. The senator was in western Alaska to investigate erosion that threatens the villages of Shishmaref, Point Hope and Kivalina. KNOM had another first, as Secret Service agents scoured the studio building, then guarded it during Stevens’ appearance. As President pro tem of the Senate, he is third in line of succession to the Presidency, after the Vice President and the Speaker of the House. 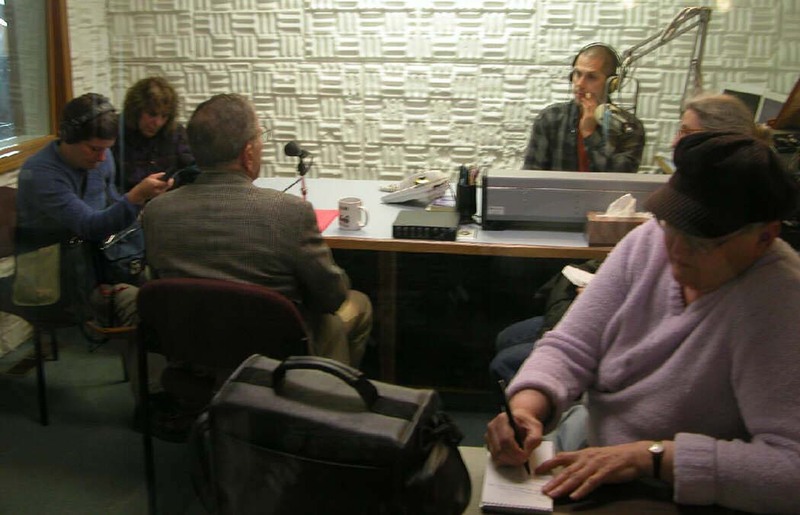 (Left) At the mixing console, KNOM news director Paul Korchin listens to the senator. Nome Nugget publisher Nancy McGuire jots notes in the foreground. Behind her sits Nugget reporter Diana Haecker . At left are reporters from the Alaska Public Radio Network and the Alaska Journal of Commerce. BLOW, GABRIEL, BLOW! 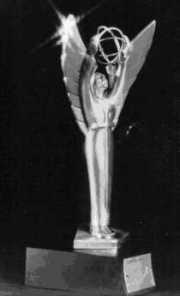 The Gabriel Awards ceremony will take place at the Holiday Inn, Silver Spring, MD, on Saturday, September 24th. General manager Ric Schmidt and program director Kelly Brabec will be there. Guest speaker will be NBC’s Tim Russert. Can you join them? We understand that the event is $65 per ticket. Time is short, as the guest list closes about September 15th. Please call Ric at 907-443-5221 or e-mail him at rschmidt@knom.org. PRAYER: Many of KNOM’s extended family - our contributors and friends - have asked for our prayers. Some have lost loved ones, or have worries for friends or for members of their families. Some suffer illness, and there are many other intentions. We ask that you join us in praying for all of these good people and their concerns. Thank you for your kindness! KNOM is the oldest Catholic radio station in the United States, beaming strong throughout 100,000 square miles of western Alaska, thanks to you. INSPIRATIONAL SPOT: The Will of God Our Father must be obeyed, to our last breath. Perfection comes from changing our will, not to this world, but to Our Father’s world. INSPIRATIONAL SPOT: It’s not enough to count your blessings. The point is to make your blessings count. Meet ERIC GUTHIER (left), KNOM’s new volunteer morning announcer and production director. 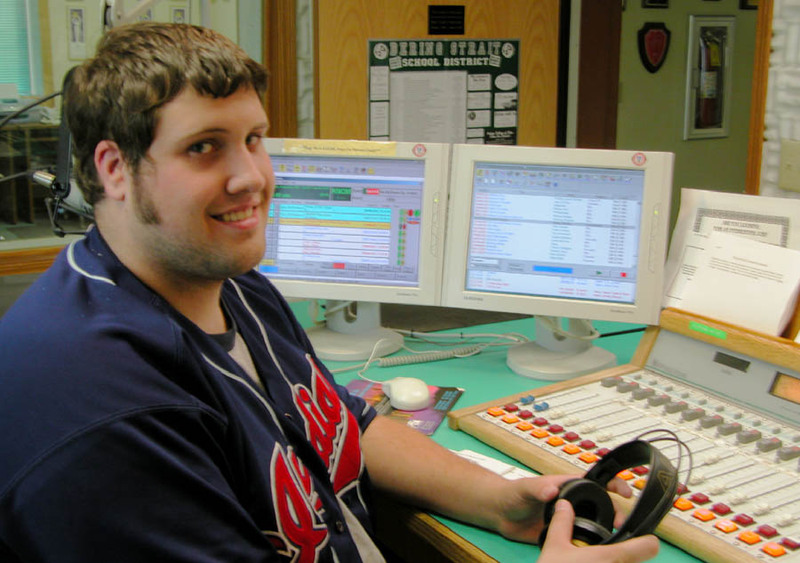 From Mogadore, OH, Eric is a graduate of the University of Akron, where he was webmaster for the school’s campus radio station. Nome!) as well as reading and spending time with friends. Eric, whose family pronounce the name GUTH-ee-ear, was on the air for only a few minutes when a listener called, insisting that he was saying his name wrong! “LES” IS MORE: (left) Les Brown cashed in frequent flier miles and flew to Nome for the month of August, installing an audio mixing console in the station’s engineering shop. Work has expanded over the years, and we needed to “borrow” space for a partial studio, and the engineer’s room was the only footage available. There still will be a small work bench. 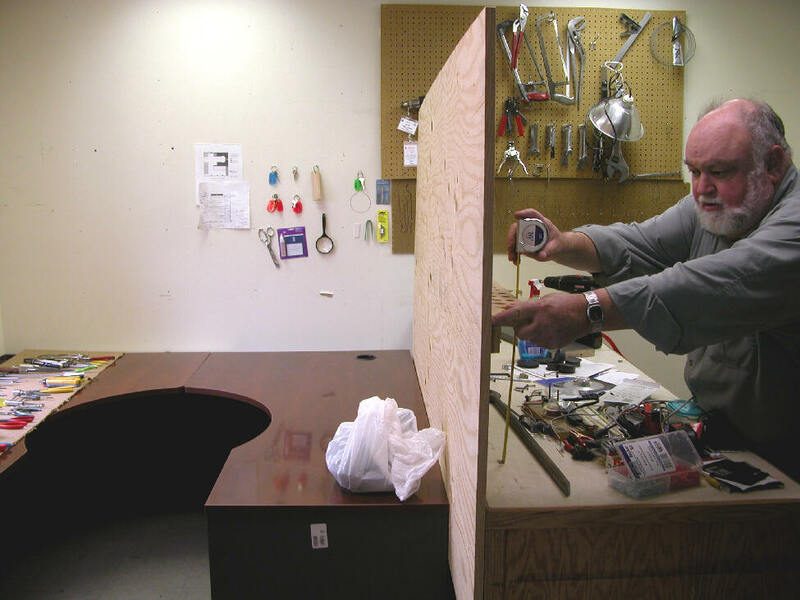 A KNOM volunteer 1972-3, Les began spending his vacations volunteering for the mission in 1990. Seven years later, he "retired," took a huge drop in salary and returned as chief engineer for six years. Les and his wife Paula, who volunteered for Nome's St. Joseph's Church in 1972-3, live in Grass Valley, California. We thank God for Les’ generosity! INSPIRATIONAL SPOT: Pepper calls attention to itself. That’s what it’s supposed to do. Salt, when used in appropriate amounts, calls attention to what it’s seasoning. Are you salt or pepper? 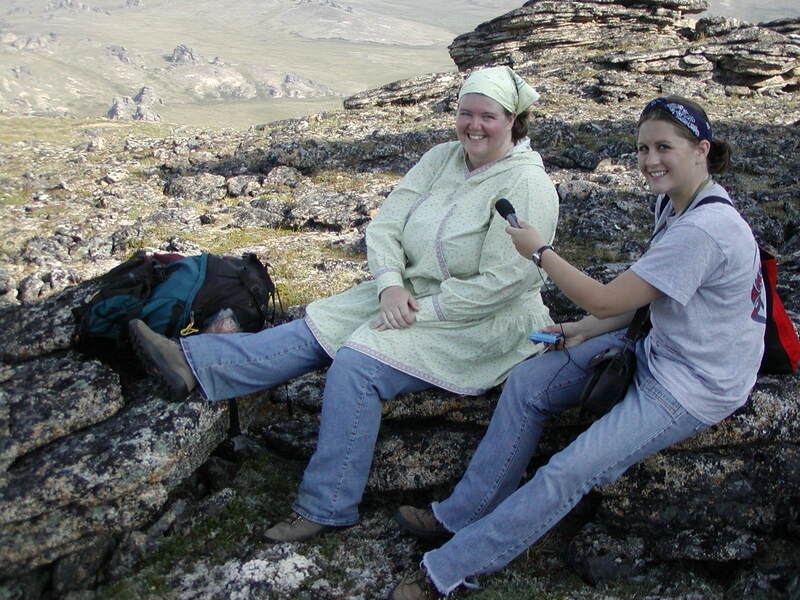 “CHERT” STORY: (left) In the wilderness 100 miles northeast of Nome, KNOM public affairs director Amy Flaherty (holding the microphone) chats with National Park Service archaeologist Sabra Gilbert-Young. The Park Service had invited Amy to extremely remote Serpentine Hot Springs, one of several locations where they’re looking for signs of ancient human life. The area is known to have been inhabited for some 9,000 years. She described the tool as “the equivalent of a prehistoric leatherman,” commonly used between 2,000 and 4,000 years ago. Interestingly, the nearest source of chert is hundreds of miles away. 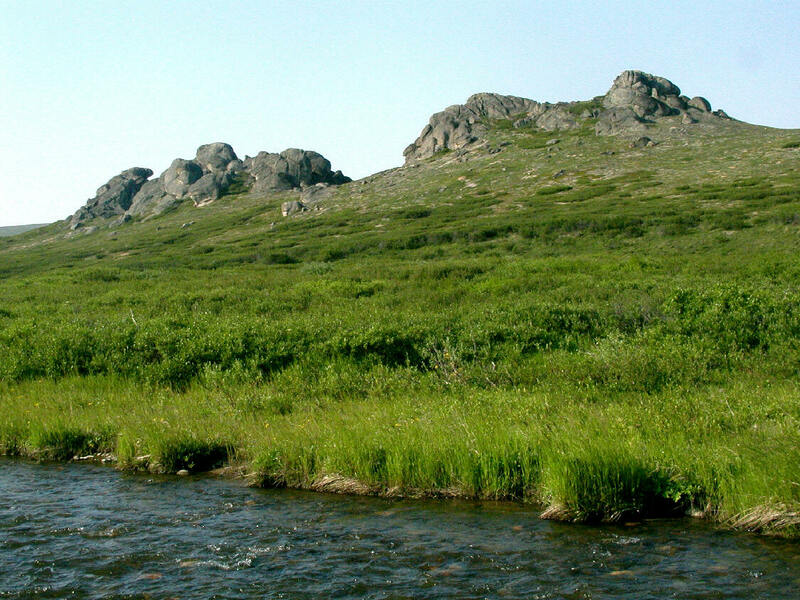 (Left) Tors, large rocky outcroppings, dominate the landscape of this remote hill near Serpentine Hot Springs. In the foreground gurgles Hot Springs Creek. SOMETHING’S FISHY: And that’s wonderful! For ten years, we’ve passed along word of declining, almost nonexistent salmon stocks in the KNOM listening area. This year, for part of the region, the tune is different. One reason may be severely limited fishing in past years. Another might be changes in water temperatures. Whatever the combination of reasons, some streams are seeing much higher numbers of salmon this year. Hurray! NOME’S DOG DAYS are usually in March, during the Iditarod Race. We did see some “dog days of summer” this year, however. August 14th, the temperature reached +81�, exactly 25� above normal. Thanks to 17-year-old Nome student Ben Peterson, who spent two hours of his summer vacation each day helping out. Immense congratulations are due Catherine Laurion, daughter of 1982-4 KNOM volunteers Christopher and Christine Laurion. In August, Catherine achieved top five in the “Miss Teen America USA” pageant. From the village of Emmonak (e-MAHNG-ek) comes a message from “everyone.” “Thank you so much for all you do for us,” it says. For many years, we have placed all bequests into funds that will provide for future major improvements, and help the mission during emergencies. We thank you for considering this most precious gift. For the chance to be and to do, we thank You, O Lord Our God. INSPIRATIONAL SPOT: When I was hurting, I could not understand why tough things were happening to me. Now I see that the most difficult times were when I felt closest to You, Lord, and when I grew the most. THIRTY YEARS AGO: (left) September 23, 1975, Yup’ik Eskimo Florence Francis arrived in Nome to serve a volunteer year as secretary and announcer. Two years later, she and general manager Tom Busch married. In 1984, with both Busch children in school, she resumed volunteering part time, and served as business manager for the mission for another sixteen years, starting in 1989. 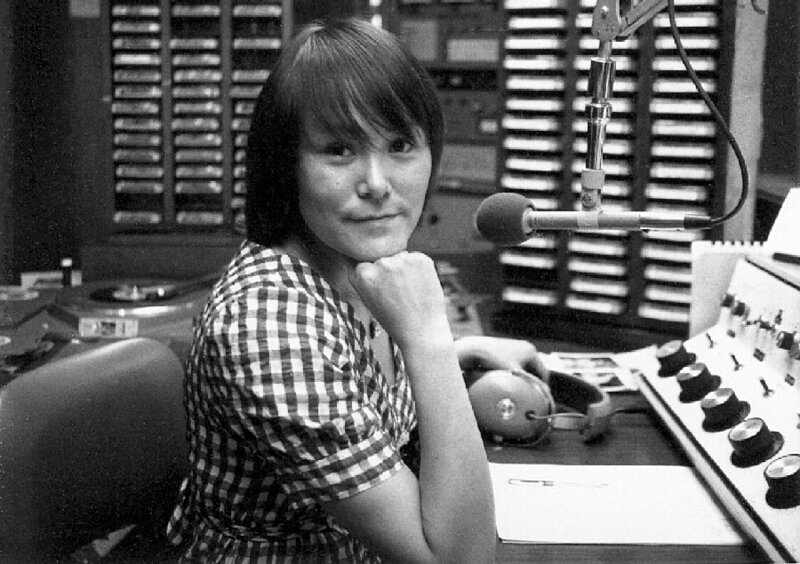 Florence was born in the Yukon River village of Pilot Station. She’s a graduate of Northwest Campus of the University of Alaska. This picture was taken in 1976 in the station’s original Studio A. VERY SPOTTY: Since January 1, KNOM has broadcast about 22,000 inspirational spots, and an equal number of educational ones. MAKING WAVES: Last month, we reported that Nome audiologist Phil Hofstetter was plying the frigid waters of northwest Alaska, kayaking from Nome to Barrow. Hofstetter was trying to raise money for the Leukemia and Lymphoma Society, as well as raise awareness about cancer treatment; a close friend has just undergone a bone marrow transplant. 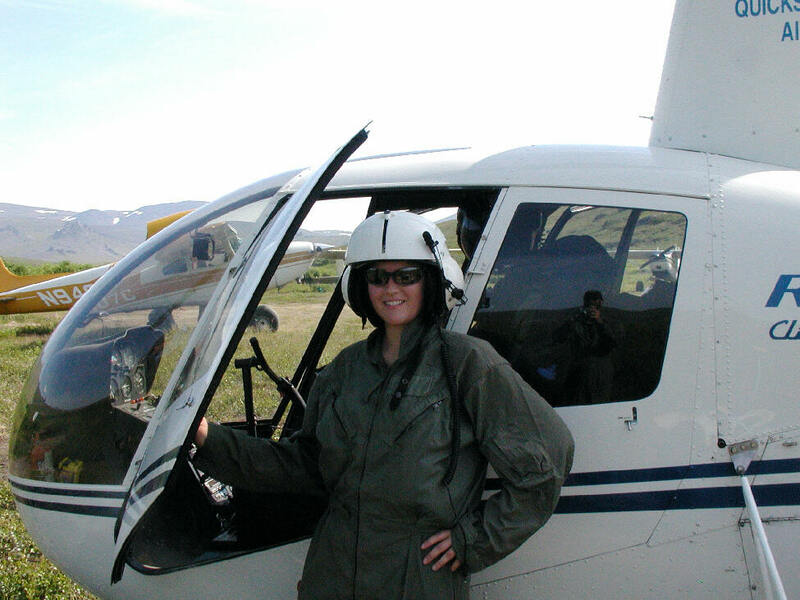 KNOM’er Amy Flaherty hopped on a small plane, joining him at the remote village of Point Lay, about 360 air miles north of Nome. (Left) Hofstetter asea, off Point Lay. 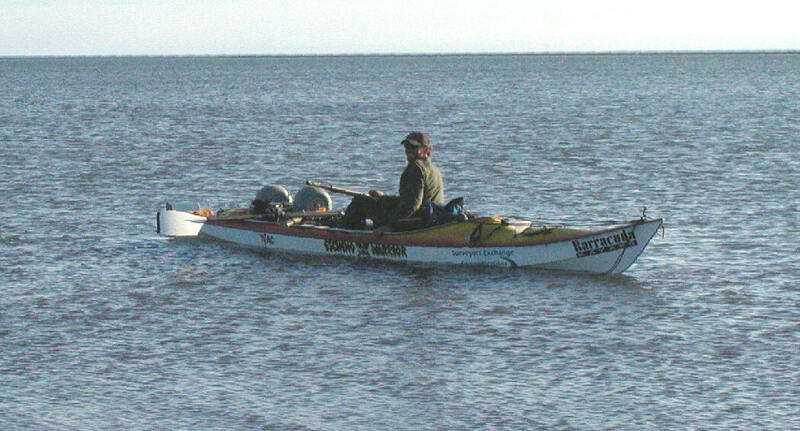 Hofstetter had been paddling the kayak for forty days, “only about four of them ideal,” he told Amy. Later, he made it another fifty miles to Icy Cape, where he was stuck for a week due to adverse winds and waves. Eventually, he worked his way back to Point Lay, where he ended the journey. At present, Hofstetter is planning to write a book about his experience. People along the coast are sharing stories about their experiences with cancer, and he has been greatly moved. Our mission relies entirely upon good people like you for its continued life and success. We continue to keep you and your intentions in our prayers. Thank you again, so very much, for your support. May God greatly bless you.